Sunday August 5th 2018, Can Dialectics Break Bricks Cinema: Latest from the DaDa-ER (Letztes aus der DaDaeR). 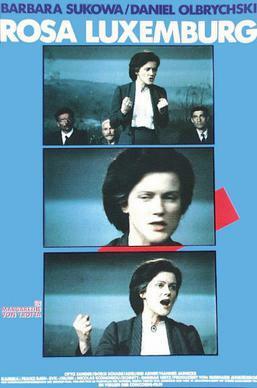 Directed by Jörg Foth, 1990, 86 minutes. In German with English subtitles. Door opens at 20:30, film and presentation from 21:00. After the Berlin wall fell the East-German film scene went haywire, since there was suddenly a small window of time that meant it was no longer under the authority of the previous GDR government, and as of yet were not forced to become commercial by the capitalist system. In this small period they knocked out some truly wild and exceptional off-beat cries of rebellion. This film is a marvelous example. It couldn’t have been made a year earlier when the GDR was still strong, and it wouldn’t have been made a year later when the DEFA studio was bought by a French conglomerate. What we have here is a avant-garde picaresque story of two East-German clowns rummaging through the ruins of the GDR, and although the clowns seem relieved that everything is loosening up, at the same time everything is falling apart and they also show no interest in the glamor and spectacle of the ‘other’ half of Germany. This film was made at a very acute point in time. The main forces behind this freewheeling creation were two visionary performance artists – Steffen Mensching and Hans-Eckardt Wenzel. 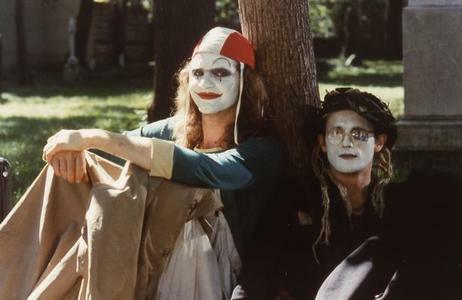 The are both the writers and the main actors in this surreal flick about two clowns trying to survive the last days of East Germany. Their journey is almost like Dante’s inferno, as they are let out of prison, and they venture through garbage dumps and down rivers into unbelievable situations. Each stage of their quest is set up like a cabaret piece, complete with songs they sing that describe their plight. They find themselves in an almost no-man’s land, and their observations are critical of both East and West Germany. The title of the movie is a play of words merging of the word ‘Dada’ and the DDR (Deutsche Demokratische Republik). This highly unique flick also surprisingly features Rainer Werner Fassbinder regular Irm Hermann in a cameo role. Another outrageously rare screening of totally forgotten cinema. Sunday 17 June 2018, Movie night: Rosa Luxemburg (1986). Die Geduld der Rosa Luxemburg, by Margarethe von Trotta. German with English subtitles | 123 min. Rosa Luxemburg (1871-1919): german-polish socialist, docorate in a time when women couldn’t graduate on German universities, speaker of the Left in the Labour Partry 20 before women in Germany gained the right to vote, co-founder of the Spartakus group, icon of the student movement in Germany. Margarethe von Trotta’s film “The patience of Rosa Luxemburg” tells her story, but als paints a clear picture of the economic and social situation in Germany before the First World War. Von Trotta didn’t work to on the basis of the ledgend. She didn’t deal with the different views of her, didn’t explain anything, didn’t justify anything. She lets Rosa Luxemburg speak for herself. The basis of the scenes and dialogues in the film are mainly the 2500 letters Luxemburg send to friends and comrades. The film only shows what can be documented in such a way – the film is radical and subjective because it is only commit to one truth: the truth of Rosa Luxemburg herself. Sunday 27 May 2018, Movie night: Girls in Uniform / Mädchen in Uniform (Leontine Sagan, 1931). German with English subtitles | 98 minutes. At a boarding school that turns the daughters of soldiers into future mothers of soldiers, 14-year old Manuela falls in love with one of her teachers. “Mädchen in Uniform” was groundbreaking in having an all-female cast; in its sympathetic portrayal of lesbian “pedagogical eros”; and in its co-operative and profit-sharing financial arrangements (although these failed). Unsurprisingly it was banned in Nazi Germany, and only re-released on television in 1977, some 20 years after a much toned-down remake with Romney Schneider. Thursday December 28th 2017, VegaZulu Freedom for Peike, Volkseten Vegazulu, 7pm. Peike is one of the activists who got arrested during the G20 demonstration in Hamburg last summer. He got charged with severe bodily harm to a police officer after allegedly throwing bottles. Even though the officer in question admitted in court not to have been hurt at all. Subsequently he got charged with resisting arrest go moving himself into a foetal position when the cops tried to arrest him. The court convicted Peike for 2 years and 7 months imprisonment, in spite of public outrage over the severity of the sentence. He has been held in captivity ever since the G20. Recently all over Germany, police razzias have been taking place, rounding up more G20 activists. This is an ongoing struggle. All yields from the benefit will go to support the case of Peike. This will also be the last voku of the year in Joe’s. Please do come! Monday the 16th of October 2017, Solidarity with G20 prisoners – OIA+KALI Queer Feminist Rap. Volkseten Vegazulu at 7pm. Between 9 and 10pm, Queer Feminist Rap on the stage. 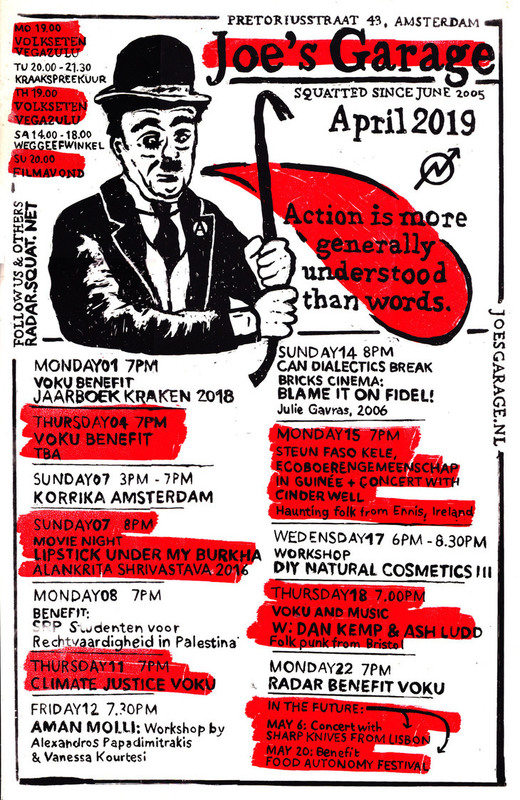 Monday 9 October 2017, Benefit voku: Solidarity with G20 prisoners. Music with Abigail Lapell and Shawn William Clarke, indie folk from Candada. Volkseten Vegazulu, 7pm then update about the G20 prisoners. Music from 8:30pm till 10pm. During the G20, political and economic leaders of the world gathered in order to plan the continuation of their wars, exploitation of people and animals, and the destruction of the environment. To revolt against this is necessary and gives hope. Hundreds of thousands of people took to the streets in Hamburg to obstruct these festivities for the elite. The German state, in an attempt to criminalise a few individuals, has now rapidly changed the topic to bottles and fireworks which were thrown (or not) during the riots. Not very convincing as a distraction for the real problems in this world. From the first day, the actions against the G20 were met with harsh repression. Hundreds of people were hurt and arrested due to police violence and the tactics of escalation. Support Peike and all other prisoners – act and show solidarity! Monday 18th September 2017, Benefit for the G20 arrestees in Hamburg. Volkseten Vegazulu at 7pm. After the food, legal update. The first court case of the G20 arrestees took place in Hamburg on 28 August. A 21 years old Dutch comrade, accused of throwing two bottles at a cop during the Welcome to Hell demo on 6 July 2017, got convicted to 2 years and 7 months jail. This trial was nothing more than a big set up before the federal elections to be held on 24 September. On 29 August, a Polish man was sentenced by the court in Hamburg to a suspended six-month prison sentence. On 8 July, during a search near a demonstration, the cops found backpack containing seven crackers, a lacrymo bomb, diving glasses, a rope and black clothes. The judge explained his decision by stating: “It is clear to the court that the accused was on his way to a demonstration “. The public prosecutor launched 109 investigative procedures against “known” persons and 64 others against “persons unknown”. The charges generally concern “breach of the peace”, “violence causing injury”, “resisting the police” and “destruction”. In some cases, the accused risk prison sentences of up to 10 years. Other procedures could be added to those already underway, as the investigations continue. Till today, 189 “presumed guilty” persons have been arrested in connection with the G20 summit and 51 arrest warrants have been issued. 32 people, who are not from Germany, are still being held on remand for the anti-G20 riots. Finally, the politicians are still traumatized by this counter-summit in Hamburg. Thus various political parties (SPD, CDU, Greens and FDP) are going to meet every two to three weeks, probably until the summer of 2018 in a commission on the G20. Various points will be addressed, including preparations for the G20, the development of the days of the G20 and its consequences. Moreover, let us recall that an unprecedented repressive blow has struck the autonomous media in Germany, almost two months after the counter-summit. Friday, August 24, the free publication platform Indymedia Linksunten was shut down by the Minister of the Interior Thomas de Maizière, declaring it prohibited by the use of the law on associations. The following day, several searches were carried out by the LKA on persons suspected of moderating the site, in Freiburg. In addition to 4 apartments, the KTS autonomous centre was also searched and the entire IT infrastructure has been seized. It is clear that the autonomous and anarchist agitation of recent times in Germany, with countless direct actions and sabotage against the infrastructure of capital and the State, is one of the reasons for the prohibition of this site, which largely contributed to the disorder, both during the days of the G20 but also especially before and after. Linksunten is one of the few German-speaking sites on which are published a good number of press releases of attacks and direct actions, which are obviously a danger to power and its henchmen. Let us not forget that if this counter-summit was so devastating, it is linked to the fact that the many anarchist calls to sabotage the G20 had a real echo across the country. Putting this platform out of use is one of the many ways that power disposes of to put an end to the offensive and insurrectional dynamic. More than ever, active and offensive solidarity with the comrades of Germany! 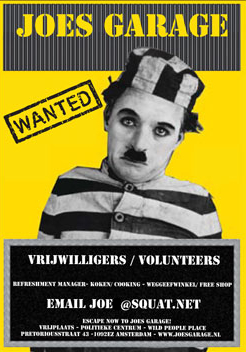 Volkseten Vegazulu is a people’s kitchen, every monday and thursday, all year long. Door opens at 7pm. Vegan food for 4€ or donation. All benefits go for social & political struggles. No reservation.